Knoxville, TN sextet WHITECHAPEL are on the road this summer as part of the Rockstar Energy Drink Mayhem Festival. The tour kicked off this past weekend with shows in San Bernardino, CA and Mountain View, CA. The first date saw the band playing before the festival’s largest crowd to date of over twenty six thousand metalheads. The band is touring in support of their recently released self-titled album, which is available at the shows and has been selling like crazy alongside the band’s merchandise. The guys are taking part in meet and greets daily with their fans at the Rockstar Energy Drink signing tent and will continue to tear up stages across the country this summer. A video recap of the tour kickoff can be viewed HERE. The band’s self-titled fourth album has been met with critical acclaim being heralded as “The band’s best album yet by a wide margin” by Alternative Press Magazine and “The band’s strongest work to date”, by MetalSucks. Whitechapel debuted at #47 on the Top 200 Chart, #10 on the Top Independent Albums Chart, #3 on the Hard Music Albums Chart (Current), #2 on the Hard Music Albums Chart (Core Stores) and #64 on the Top Digital Album Chart. The band has released a video for their song “I, Dementia” which was shot by David Brodsky of MyGoodEye as part of the Scion AV Project. The video is available to view HERE courtesy of The PRP. Whitechapel is available to order in exclusive bundle packages HERE. 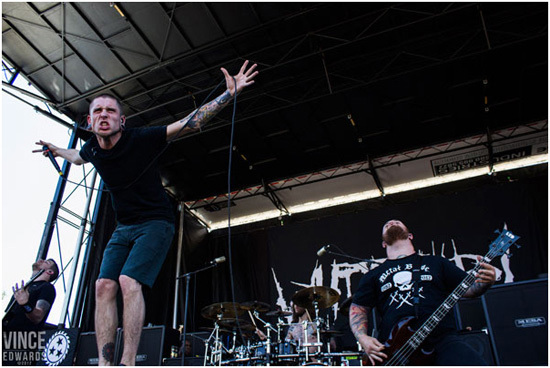 Having spent several years lauded as one of the frontrunners in their genre, in 2012 WHITECHAPEL stand as a defining force in contemporary heavy music. Building dramatically on the trademarked bludgeon of their first three releases, with Whitechapel the Tennessean sextet have inarguably delivered their most intense, dynamic, and downright hostile record to date. Drenched in atmospheric darkness, the record is also rife with gripping melodies that drag the listener in to the tumult, willing or otherwise, and across its ten tracks it is infused with an emotional depth that pointedly separates the band from the plethora of two-dimensional mosh-starters that have sprung up in their wake. The album was engineered and mixed by Mark Lewis (Black Dahlia Murder, DevilDriver), who also handled production duties alongside the band. The album artwork was created by Aaron Marsh of Forefathers Group with art direction provided by WHITECHAPEL.